What's to come in 2005. I think I forgot to post a link to this. Here's an article from us written for Secure ID News. It's all about our predictions for the future of the industry, and how the government is playing a large roll. And *sigh* yes, even large corporations. Biometrics in the Mainstream - a good read. If you get a chance, you should pick up the October issue of Access Control and Security Systems magazine. The feature article is called 'Biometrics in the Mainstream' and there are a few quotes from our CEO. Also included are thoughts from AuthenTec, BIO-key, LG, Fujitsu, Samsung, Identix, and much more. Not so long ago, biometrics suppliers tended to provide uncustomized 'black boxes' with unchanging components. Now, more biometric suppliers are scrapping the myster box approach for a two-tier structure, with some companies providing specialized components and others devising complete systems from these targeted elements. "You cannot be master of everything. Biometrics is a vast field. 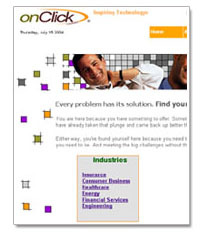 Taking theoretical science to tangible products requires the expertise of several different focused skill sets," says Wasif Khan, president/CEO of the Houston-based onClick Corp. "In order to bring to the marketplace scalable and reliable products that create value, companies must focus on what they know and do best. Biometrics is definitely a two-tier process, each company embedded within the other's strategy, creating success and value for each other." If you're looking to subscribe to this or another other weblog, you might want to give one of these RSS readers a try. This way, you don't have to remember to come back to the site every day, you can just be alerted any time there is a new post. Makes life a little easier. To subscribe to this blog, just use the address of the link in the left column on top. Or the reader will probably find the feed for you given the base address. If you haven't been to our website lately (the real one, with all the products and whatnot), then you should go. Don't forget to also check out the educational section, dubbed 'About Biometrics'. Your opinion matters. At least to us. We put a new survey question up on our biometrics website homepage. It has to do with having biometric passports. So go vote already. We've updated the links to outside tech/gadget blogs (see the right column near the bottom), adding more sites that drop entries on more than just biometrics. Including GadgetMadness, which just ran a blurb on our FreedomPass Mouse. What did you say? OH. The weblog will be on vacation starting tomorrow. New posts will begin to appear again June 14. Until then, you have homework. There WILL be a pop quiz.